Baptism is the first of the three sacraments of Christian initiation: Baptism – Confirmation – Eucharist. If you want to be baptized in Christ and become a member of our Catholic Church. If you wish your child be baptized. The word confirmation means strengthening. The newly baptized at Samaria received the strength of the Holy Spirit by the prayers and lay of hands of the apostles Peter and John. All baptized have part in the gift of the Holy Spirit promised by Jesus. Those who are baptized as adults receive along with Baptism, the sacrament of Confirmation and Holy Communion. However, those who are baptized as a child must follow all the way through First Communion to Confirmation. The sacrament is called Confirmation, because the faith given in Baptism is confirmed and made strong. Confirmation means accepting responsibility for our faith. Normally, only the Bishop confirms the Catholics in his diocese. However, priest can be delegated by the Bishop to confirm. Peace be with you. R/. And with your spirit. If you have never received the Sacrament of Confirmation you can still do it and so complete all the Sacraments of Christian Initiation. Call the Parish office and we will let you know how to proceed. The Sacrament of Penance, also known as Reconciliation or Confession, is for spiritual healing. It is not expected from a disciple of Jesus to lie, cheat, hate, steal, having immoral or unethical behaviors, take advantage of the vulnerability of others, being unfair, being rude, and discriminating others by reason of their belief, race, language, culture or any other reason. These are some among many others behaviors, which are sinful because they show a great disrespect for God’s commandments and deny Jesus’ message. God’s mercy is the remedy for our sins. The bishop or priest can help you to get reconciled with God, the Church (community of believers) and yourself. Telling sins to a priest is not as scary as people think, because the priest has a shepherd’s heart. His mission is to bring God’s healing to people. and of the Holy Spirit. R/. Amen. If you feel that you need to go to confession, call the parish office and ask for the time of confessions; you may also make an appointment with the priest. The priest will be happy to help you reconcile with God, the Church and yourself. We invite you to consider completing the Sacraments of Christian Initiation if you need to do so. Please call the Parish office and we will be glad to offer you information. If you have a child age of preparation for First Communion and/or Confirmation, enroll him or her in our Religious Education Program (CCD); we will help you with that. Please call the Parish office for information. If you did your First Communion, but for some reason you have left the Church, it is time to go back and reconnect with Jesus Christ and your Catholic Church! We are your Christian family. St. Columbkille is a community of good, simple and cheerful people. We welcome you with open arms, merciful hearts and big smiles. Come home, please!!! Loneliness does great harm to humans; for this reason we are called to live in community. Marriage is like a cure for loneliness! If you are looking for a Church to get married, you are very welcome at St. Columbkille. We are glad to give you our support. 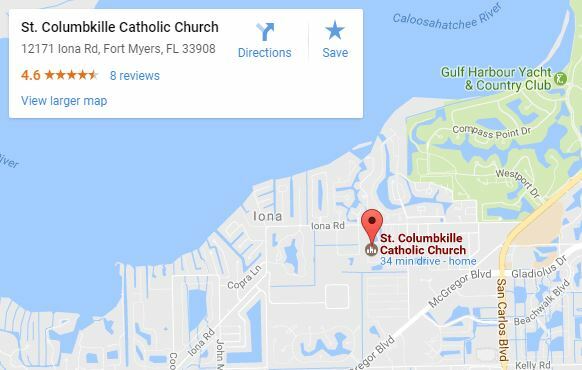 Please, call the Parish office and ask for information, and know that we feel blessed with your choice of St. Columbkille Parish to begin here, your married life. It is a fact that some catholic couples got married only by civil law, have created a beautiful family, and they also desire to be married by the Church. We can help you to make your wish come true! Please, call the parish office to receive the information you are seeking. It is a fact that some young Catholic couples are living together without engaging in marriage. Although the Church discourages this practice, we recognize the value of love for each other. God knows how much kindness and generosity is in their hearts. We encourage them to formalize their relationship by blessing their love through the Sacrament of Matrimony. 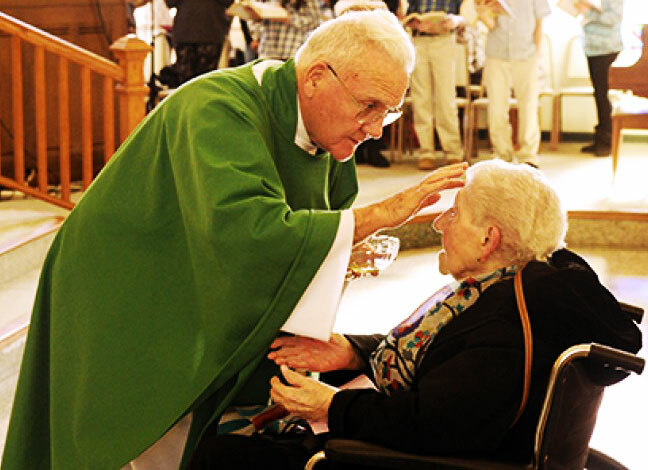 It is a fact that some Catholic couples, married by the Church, could not achieved the ideal of remaining attached to each other to the end of their lives. The Church is aware that divorce involves a lot of frustrations and pain. Given the need to give a new direction to their lives, some have gone through a new civil marriage. We encourage them to consider the petition of an annulment of their previous marriage. If so, the Church will be able to bless their new relationship. Nonetheless, be aware that you are part of our family and by no way you are considered second-class members of our community. It is a fact, too, that some brothers and sisters feel the need to ensure adequate integration between their particular sexual orientation, their catholic faith, their love for the Church and the need for “not experiencing loneliness.” We are aware of the complexity of this fact and how much frustrations it brings to them. We want to assure you that you are part of our family through baptism, and our community, with its merciful treatment, wants to be a place where all may experience the unconditional love of God. There is also in the Church “the ministerial priesthood.” In this “ministerial priesthood’ participate bishops, priests and deacons, each one at a different level. They are consecrated by means of a special sacrament called Holy Orders. The bishop is the shepherd of the diocese with the responsibility to guide the flock to meet the “great shepherd”, Jesus Christ. His ministry includes “teaching” the message of the Church, which is the message of Jesus, and administering the sacraments. Vocations are born in prayer and from prayer; only through prayer can they persevere and bear fruit. never lose consciousness greatness and necessity of their vocation. as you said at the Annunciation. Jesus was very sensitive to human suffering. Whenever he found someone who suffered, He healed him or her. (Matthew 8:1-18) So good is Jesus! If you want to register your child or yourself for Religious Education (CCD) in preparation for First Communion or Confirmation, Please contact the Parish Office during normal business hours.